The main focus of the Grand Prix event was to hand out bike maps to all visitors at the event tent, with the message ”Thank you for cycling”. The target group was cyclists at the shopping area Kvarnholmen and the crowd for the annual Kalmar Grand Prix cycling race around the city center of Kvarnholmen. From the event tent at the expo area, organic cycle candy and seat covers were also handed out to cyclists and visitors. People could win cycling water bottles and books about the advantages of cycling. Bike service (pumping tires and oiling bicycle chains) was also offered at the event tent. 1500 students visited the annual welcome event for new students at the Linnaeus University and about 500 of them picked up a bike map from the Kalmar municipality event tent. Seat covers and organic bike candy was also handed out to the students and three slides from Kalmar Cycle City were shown at a monitor rolling during the day. In autumn 2013, the big bicycle parking at the central station at Kvarnholmen was improved significantly. The bicycle parking now has more open space, safer parking possibilities, more lightening and a manual bike pump. The improvement of the bicycle parking also included the first parking for cargo bikes and cycles with trolleys. 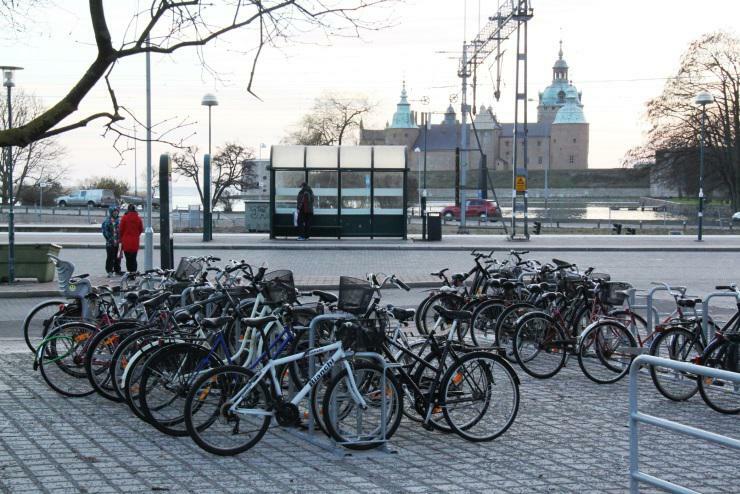 The parking was inaugurated on a cold and windy hour in December, while Kalmar Bicycle City handed out warm beverages, cookies and bike maps to passing cyclists. To get our children to cycle to school is essential. The routines and habits we establish at an early age are the ones we carry with us through life. It is also a good way to combat child obesity. 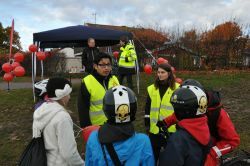 To acknowledge the newly built cycling lane in Funkabo and to encourage more children to cycle, Kalmar municipality, together with the NGO NTF had a „cycle safely“ activity outside the Funkabo school. The event focused on what equipment you should use: lights, reflexes and helmets, and how to behave when in traffic to be safe. We also had information about the municipality's work for interested parents and talked about our ongoing projects such as the ABC multimodal project. About 100 school children joined our activities that day and hopefully we have encouraged a few more to cycle to school!